Experience small town atmosphere and big town fun, just 20 miles west of Atlanta! No matter how you choose to spend your time, we invite you to… "Create Experiences that Matter. " Fall Fun comes to Douglasville this weekend! Looking for some fun this weekend? Downtown Douglasville will be packed with a variety of amazing things to see and do! 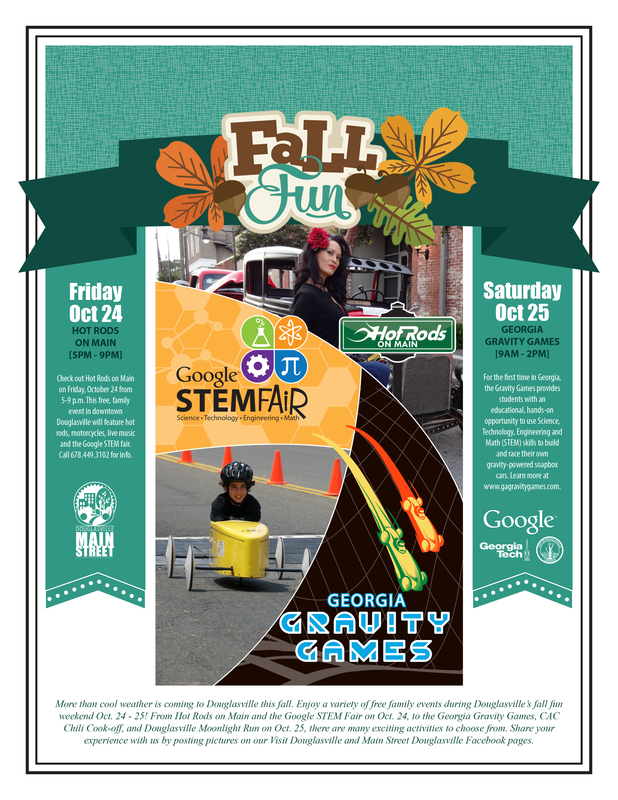 Among traditional favorites, a collection of new and improved events will debut this weekend including Hot Rods on Main and the Google STEM Fair on October 24, followed by the Georgia Gravity Games on October 25. Douglasville will be home to the first Georgia Gravity Games hosted by Google–the world’s leader in Internet-related services and products. The Georgia Gravity Games will highlight the weekend with a soapbox derby featuring 21 racers from local schools, business, public service groups, and non-profits. Enhanced with Google flair and excitement, the downhill race adventure is sure to be an extraordinary experience for all ages to enjoy. Read more or click to view a special video that highlights local students as they prepare their soapbox car to race at the Georgia Gravity Games. Friday, October 24, 2014 | 5:00 p.m. – 9:00 p.m.
Friday, October 24, 2014 | 5:00 p.m. – 6:00 p.m.
Saturday, October 25, 2014 | 9:00 a.m. – 2:00 p.m.
Saturday, October 25, 2014 | 5:00 p.m. – 9:00 p.m.
Saturday, October 25, 2014 | 7:00 p.m. – 11:00 p.m.
Connect with us and join the conversation! Connect with us on Facebook, Twitter, Instagram, Pinterest & LinkedIn! Event filled weekends ahead in Douglasville!